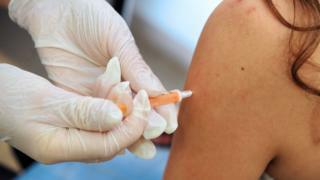 Vaccinations against chickenpox are to be offered on the High Street for the first time. Superdrug will be offering it at 58 of its specialist pharmacist stores at the cost of £130 for a two-dose course. The vaccine is only available on the NHS for people at high risk of spreading the virus to those with weakened immune systems. The NHS says a routine childhood chickenpox vaccine would raise the risk of more serious infections in adults. Ninety per cent of people catch the chickenpox virus by the age of 15 and in most cases it is uncomfortable but leaves no lasting effects. Symptoms include an itchy red rash of spots and blisters, and a fever, as well as tiredness, nausea, headache, muscle ache and loss of appetite. People who catch the virus as a child normally become immune for life, although one in three adults can develop shingles. Adults can still contract the virus but symptoms and possible complications are usually more serious, including the risk of pneumonia, hepatitis and encephalitis. People have for some years been able to pay to get the vaccine from a variety of sources outside of the NHS such as travel clinics. Dr Pixie McKenna, a TV doctor who advises Superdrug, said: "Chickenpox is often seen as a rite of passage in childhood resulting in anything from a very mild to a more serious infection in different people. Even in straightforward cases, spot picking can lead to long-term scarring which can linger long after the infection is gone. "A chickenpox immunisation has been available for many years but not on the High Street until now. Having suffered from severe chicken pox at the age of 19, I would far rather have undergone the vaccine than be struck down with the infection!" The vaccine will be available in 58 Superdrug stores, across the UK. The store recommends two injections, four to eight weeks apart. Chickenpox immunisation has been available in the US for children under 13 for 20 years and research by the Paediatric Infectious Diseases Society shows it has seen hospitalisations due to the disease fall by 93%.